Mission Statement: We are a passionate team striving to operate an industry leading property management and vacation rental business. Our mission and values are driven by a “service first” culture, resulting in owners and guests that are raving fans. Chris & Jen Torsleff are the Managing Partners of Stay Montana. They have over 55 years of combined hospitality and resort property management experience working and learning from great companies like Vail Resorts, Ritz Carlton, Hilton, & Marriott. We are proud of the fact we started out in positions of bellm an and busser and worked our way to key leadership roles in some of the most respected companies in the hotel and resort industry. Chris and Jen were married in Moonlight Basin 17 years ago and continue to enjoy mountain life in Bozeman and Big Sky. 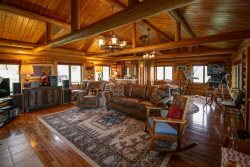 Their son loves ski racing with the Big Sky ski team and their daughter loves skiing, horseback riding, and baking cookies for all our vacation rental guests. Their combined passion for hospitality excellence and creating amazing experiences for our guests inspired the startup of Stay Montana. David is an avid snow boarder and has an overall passion for mountain living. He grew up in the Denver Colorado area and attended the University of Colorado Denver. David's passion for creating memorable experiences for our guests started as he worked in Breckenridge, CO for Vail Resorts and he guides his team of 3 property managers and 2 Concierge's towards that goal everyday. If you don't find David jumping into the Big Couloir, then you will sure find him mountain biking with his two dogs Keira and Zeke. A passion for the mountains and his love for fly fishing drew CJ to Montana. His extensive experience working for Beaver Run Resort and Vail Resorts has fueled his passion for hospitality. If he is not fishing somewhere on the Gallatin or Madison rivers, he is usually leading his team to ensure the perfect rental for your next stay. Growing up in Montana Amber has always felt at home in Big Sky country. We she is not crunching numbers for our owners, Amber is usually exploring this great place we call home! Michelle loves spending time with her kids exploring the great outdoors of Montana! With 11 years of experience in housekeeping, Michelle's attention to detail is unmatched. She is a true inspiration to the team as she leads them towards exceptional cleanliness and guest experiences. Alex was born and raised in Bozeman and is no stranger to Big Sky Country! Alex showcases the uncommon beauty of Montana and Stay Montana's vacation homes to an instagram following of over 15,000. Graduating from Arizona State University with a degree in Communications and Business Alex learned the art of social media marketing quickly after college. We are blessed he has joined the team to share the wonder and beauty of Montana to our growing audience.